Majavatnet (Norwegian) or Maajehjaevrie (Southern Sami) is a lake in the municipality of Grane in Nordland county, Norway. 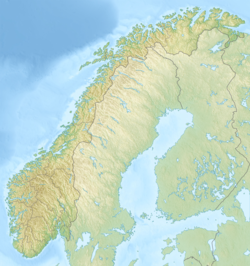 The 16.6-square-kilometre (6.4 sq mi) lake lies just west of Børgefjell National Park in southern Grane. The village of Majavatn lies on the eastern shore of the lake. European route E06 and the Nordland Line both run along the eastern shore of the lake. ^ Store norske leksikon. "Majavatnet" (in Norwegian). Retrieved 2011-11-28. This page was last edited on 24 February 2019, at 21:13 (UTC).